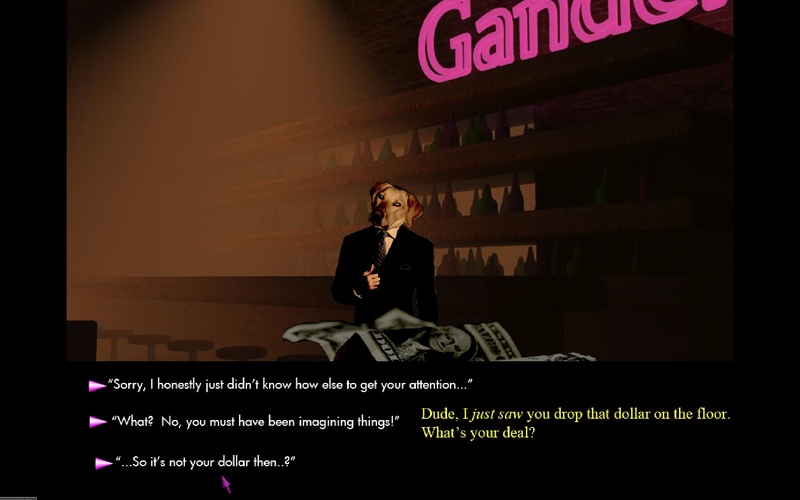 Gander is a Gamemaker-developed experimental point-and-click dialogue experience. With Gander I hope to develop a stylized dialogue & character-driven interactive world, where dialogue choices are made with subtle strategic thoughts in mind, and reactions feel true to the development of the characters. The written dialogue also provided me the ability to deliver lines that might not be as effective if spoken. It feels at times like reading a visual storybook, and I enjoy the possibility that there still might be room for games with written rather than spoken dialogue even in this time of Hollywood-level voice-acting. Through the development of Gander I learned a ton about the complexity of dialogue trees and how quickly branching choices can lead to an unmanageably large amount of assets. Although the scope was limited for this project, it branched enough to demonstrate the potential of what might be narratively possible in this storytelling mode. You may watch a full playthrough video of Gander below, but I suggest you try playing it yourself! Open the .exe to play.